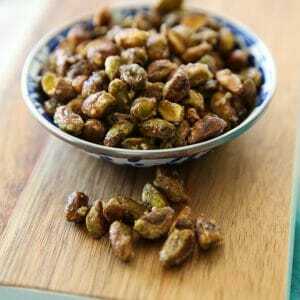 I’m sure you’ve candied all the standard candied-nut varieties, but have you ever tried candied pistachios?? 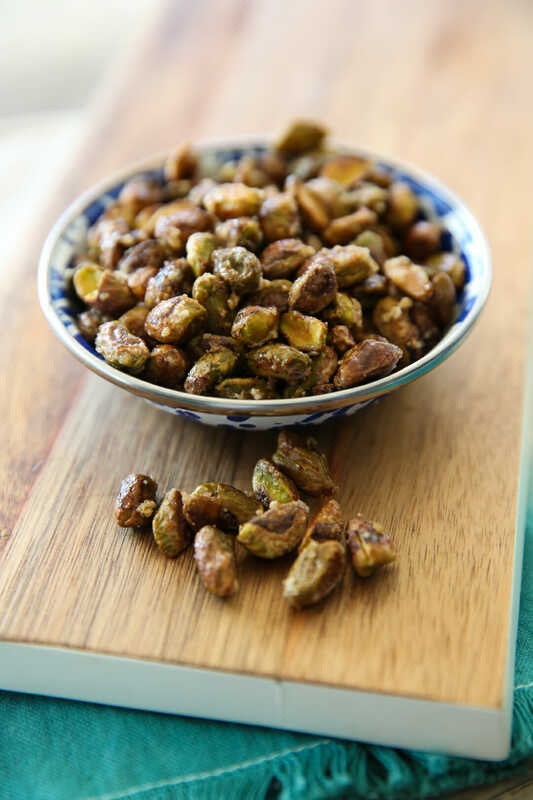 I was working on a new salad recipe the other day and I bought some pistachios to toss in there and since I pretty much always default to sugar-coating my salad ingredients the thought occurred to me that I had never candied pistachios. 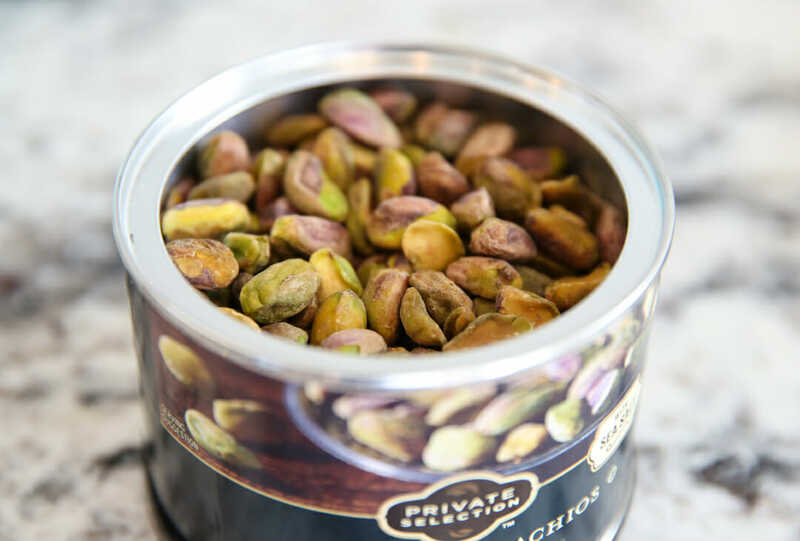 I love the bright green color and unique flavor of pistachios and adding a sweet-crunchy glaze took them to a whole new level! 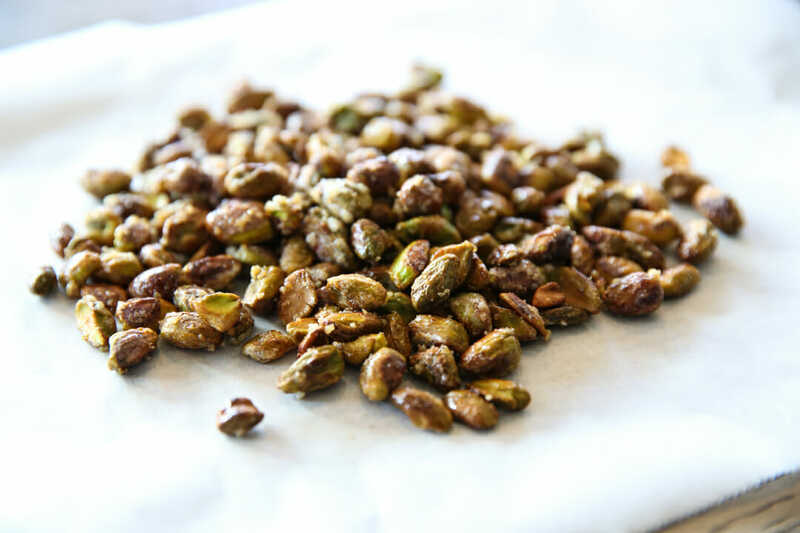 I’m going to show you a really quick and easy way to make candied pistachios. They’re so great on salads, but my family loved eating these straight from the dish. This is the easiest, most simple method for candying any type of nut- simply place in a non-stick skillet with some granulated sugar. (This is the same method I shared for my candied peanuts as well.) Now the fancy method would be to melt sugar into a liquid caramel of sorts and then coat the nuts, but I love this method of adding it all together to the pan because you’ll get some bits where the sugar stays in little crystalized chunks and it makes them extra crunchy and delicious. It only takes a few minutes and then you can slide them right out to cool on a sheet of parchment or a silicone mat. You can see in this photo below what I mean about those crunchy bits- see the little sugar clumps? I love those! These are fantastic in salads, but also great simply to snack on. They’d be great on a cheese plate or just in a bowl! If you loved candied nuts, here is another recipe that’s super old, but it’s super good. I use this method if I want a more dessert-style nut. Happy snacking! 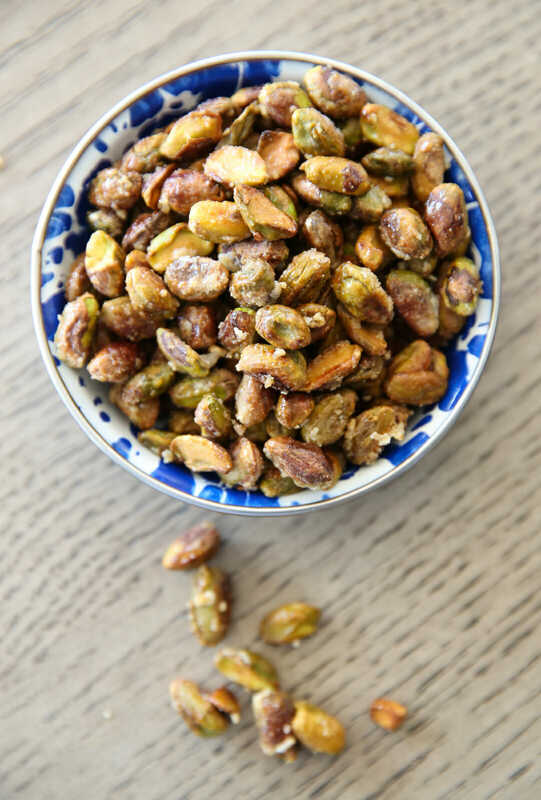 A super easy way to add a sweet, crunchy glaze to pistachios. Great for salads and snacking! Heat a non-stick skillet to medium heat, add nuts and sugar. Gently toss and stir and sugar will begin to melt. 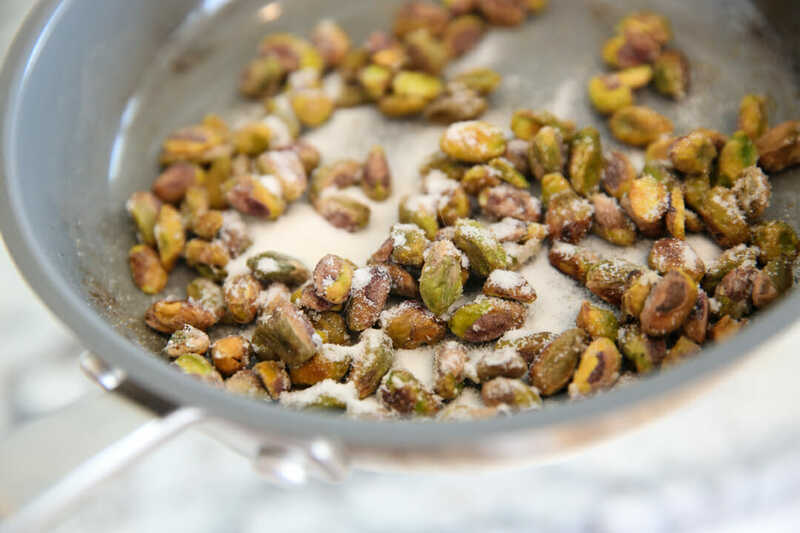 Continue to cook until most of the sugar is melted and pistachios start to turn golden brown. You may need to turn your heat down so sugar doesn’t burn. It’s okay if you still have some clumps of sugar on the nuts that doesn’t look melted- it adds crunch! Slide all the nuts out of the pan and onto a piece of parchment paper (or a silicone mat). Cool completely. They will be a little soft at first and then crunchy after they cool all the way. Sprinkle onto your favorite salad or pop in a snack mix, or eat plain! The last two times I tried this method the sugar never melted. Any ideas why? It was fresh sugar so I don’t think the sugar was the problem. Do you thunk it has something to do with the coating on the pan? I literally have no idea! That’s super weird (and kind of impossible?? lol!) Maybe crank up the heat a bit? What would be a good spice to add if you wanted some heat with the sweet?